Now lets learn how to configure Mozilla Thunderbird with your existing email account using the IMAP email protocol. Then click Skip this and use my existing email. 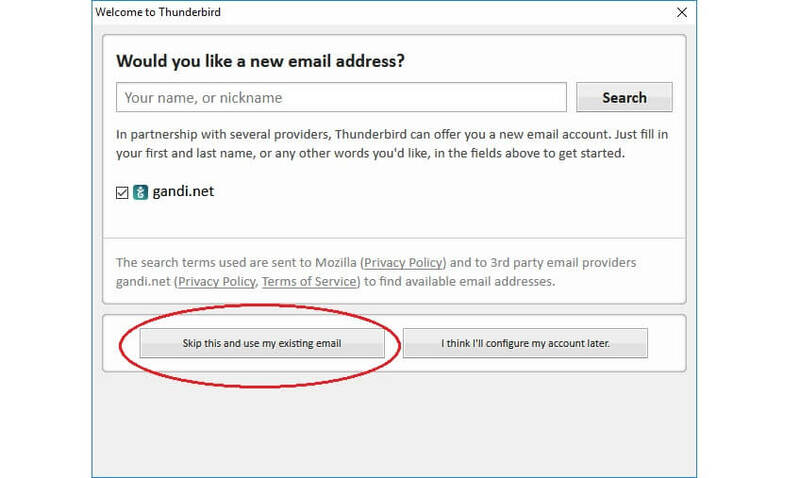 Thunderbird will now attempt to automatically look for the email settings. Choose the IMAP protocol for the Incoming account type. Then make sure you have the correct incoming mail port number entered. Your incoming port number for the IMAP protocol should be 993. Choose Encrypted password as the Authentication method. Enter your email address in both the Incoming and Outgoing Username fields. That's it! We've successfully configured Mozilla Thunderbird to send and receive email using our email account. This is the end of the tutorial. You now know how to configure Mozilla Thunderbird with your existing email account using the IMAP protocol.